There's a point in every gamer's life as they get older when they realize that with work and everything else going on in their lives, they just don't really have time to play every game they want to anymore—no matter how good it is reported to be. And after spending over four years constantly "planning to play Persona 4," I guess I need to admit to myself I've hit this stage. While it does rely on more than a few ridiculous plot contrivances (e.g. 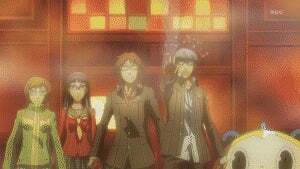 all the people forgetting the kidnapper's face) to keep the mystery going, Persona 4 is a great murder mystery. Each time another crime occurs you feel the heroes are getting closer to the answer and the suspect list gets smaller and smaller. Yet, thanks to twists and turns in the story, putting the whole thing together is challenging enough that there's a good chance you won't be figuring it out before the characters do. In other words, it walks the fine line of a good detective story perfectly. Besides going into TVs to stop a psychopathic killer, Persona 4 is about learning to accept yourself, both the good and bad. Inside the TV world, the characters are forced to confront the darker sides of themselves—the parts we all like to pretend don't exist. Whether a girl denying her very gender or a guy trying to deal with the fact that he likes "unmanly" things, Persona 4 deeply explores these emotional and personal truths that many people secretly struggle with. Watching this anime (or playing the game, I assume) might actually help people come to terms with some of the more "shameful" parts of themselves—and that is something commendable for any work of fiction. One of the best things about this anime adaptation is that it has the ability to break away from the player character, Yu, and follow other cast members when needed. This is best demonstrated in an episode where we follow Yu's cousin, Nanako, as she, removed from the situation, is trying to figure out just what Yu is doing all the time. As a Persona player, I know he is forming "social connections" to strengthen his personas. But Nanako and the rest of the cast have no idea why he is meeting all these random strangers (many of them older women). The subsequent episode then shows the same events, only from Yu's point of view: He is seemingly caught up in several people's problems and does his best to help out. As a set of episodes, it really lets players of the franchise see their actions from both the inside and outside—and see how weird Yu's actions must seem to everyone else. Persona 4, like Persona 3 before it, has a great soundtrack that somewhat defies classification (J-pop-techno-rap maybe?). Despite this, it fits the world perfectly and sets the tone for the series. Even though I had never heard the sound track before, the first few cords of the opening theme were enough for me to think, "Yep, this is a Persona soundtrack alright." Of course, for me as a Persona 3 fan, the most mind blowing part of the series is when the characters are going on a field trip and suddenly the opening theme is "Burn My Dread," the opening theme of Persona 3. In fact, for that entire episode (where they visit many of the locations of P3), the soundtrack is ripped directly from that game. It's nice to know the creators of the anime care so much about how the music interacts with the story. Yu Narukami is one of the oddest characters in any work of fiction ever. This is largely because he isn't a character. In the game you control him, so you decide his actions and the reasons he does said actions. The anime has no such viewer interactivity. As you never know his past or the motivations that drive him, all his actions seem random and inexplicable. And as he is often silent, this makes Yu a total wild card in his own story: You never know what he is going to do in any situation. His personality has only three forms: silent, blunt, or deadpan humor. In fact, the most common thing he "says" is a confused sounding grunt. Most of the time, all he does is stare at the other characters with dead, dead, eyes. But while all this may seem like a constant stream of negative criticism (which, frankly, it is), Yu's no-backstory status makes him incredibly interesting to watch—kind of like a time bomb you know is set to go off any minute. Everything he does or says is a total surprise. And, to be fair, by the end of the series, enough has happened that he does become a character in his own right based only on the actions we have seen in the anime. The "true ending" final episode OVA is actually nothing but character development for him which actually implies—though never explicitly shows—a backstory. Better late than never, I suppose. The only major problem with the series is that sometimes it just goes too far and goes from humorous to insulting. When dealing with the repressed side of the aforementioned guy who likes "unmanly" things, the main cast was confronted with two naked, giant, composite half black/half white, masochistic, gay men. One of the giant men then approached two of the male leads, grabbed their asses, and fondled them (which "drained their fighting spirit," leaving them both defeated and shamed on the floor). The implication of that scene (i.e. that gay men sexually assault young boys) is homophobic, to say the least, and not at all funny. 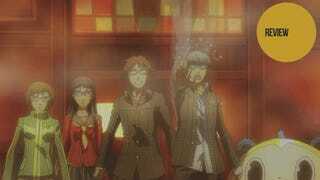 Aside from the horribly homophobic scene mentioned above, I really enjoyed Persona 4: The Animation. It was a great detective story and held its own even without gameplay to fall back on. I loved the exploration of the darker sides of people's personalities and found Yu's lack of character compelling in its strangeness. Really, the only problem I had with the overall story as part of the Persona franchise was that Yu never really pursued any of the potential love interests—though he does seem to end up with one of the girls by virtue of never turning her down. Yet, despite my enjoyment of what I saw, I actually have little-to-no inclination to play Persona 4 or Persona 4: Golden. I feel that I have gotten the best out of what there was to get in the game. The sequels like the fighter Persona 4 Arena and the manga Persona X Detective Naoto, however, are now firmly on my "must buy" list. The first half of Persona 4: The Animation is available in English on Blu-Ray and DVD, with the second half to be released on January 15, 2013.